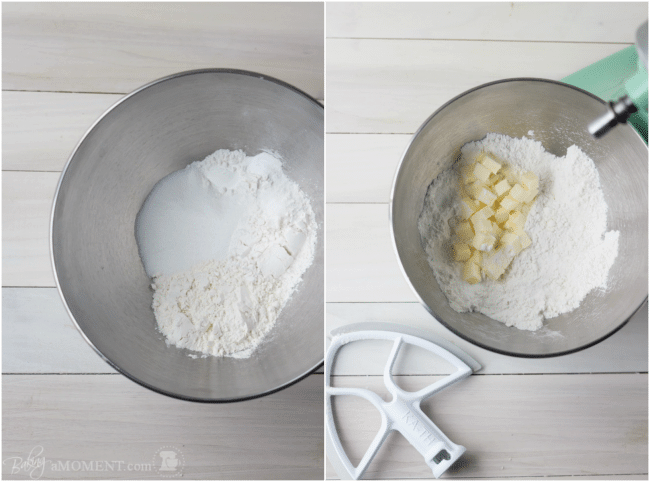 How to make a perfect vanilla cupcake, from scratch! 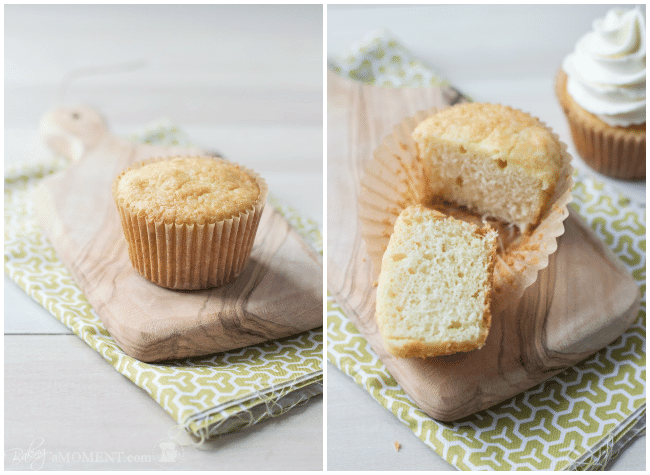 This tutorial, with pictures, is based upon my Simply Perfect Vanilla Cupcakes. The new recipe is even simpler, and more perfect! You’ll love the moist, tender texture and rich vanilla flavor, and this method is easy as be, with just one bowl! My Simply Perfect Vanilla Cupcake recipe has been one of the most popular (and commented upon!) posts on Baking a Moment, since it was published back in July. But there were a few issues, and a lot of questions I wish I had addressed within the post. The taste has to be amazing. The texture has to be spot on (for a cupcake, this means moist and tender, but sturdy enough to stand up to lots of yummy frosting). It has to be relatively easy to make. The process of making it should result in as little mess as is humanly possible. This newer vanilla cupcake recipe is based upon the last one, with a little tweak here, a little tweak there. The key difference between this one and the last is the addition of Greek yogurt. The final result won’t taste like yogurt, but the acid in the yogurt reacts with the baking soda to help the cupcakes puff up and hold a nice dome. 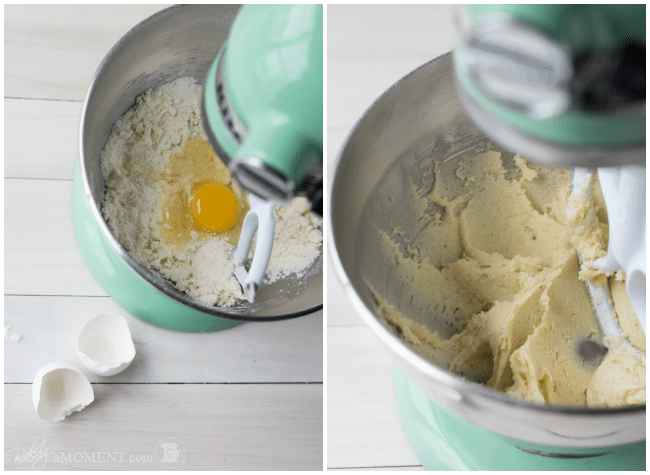 And it makes the batter so nice and thick, with an airy texture almost like whipped cream. I don’t often do in-process photos (because, quite frankly, they’re kind of a pain), but I really wanted to make this post more of a picture tutorial. I know from the last time, that you guys are really on a quest for the ultimate cupcake, and so hopefully these step by step pics will help to answer your every little question and get you exactly the results you are after! Start by combining all the dry ingredients in a large mixing bowl. I like to use cake flour, because it’s got less gluten than all purpose flour, and so it results in a lighter, more tender cake. I have no trouble finding it at the regular supermarket, but if you have any difficulty at all, don’t hesitate to order it online. Add the soft butter, and mix until it resembles damp sand. This should only take about a minute or so. After the butter has been worked in, you can add the eggs. One at a time, and make sure each one is completely incorporated before adding the next. I love this kind of paddle attachment– it has a silicone edge that reaches all the way to the bottom of the bowl, so you know all the ingredients are well incorporated. And you don’t have to keep stopping the mixer to scrape the bowl. Finally, in goes the yogurt, milk, and vanilla. When it comes to ingredients that add flavor, I recommend using the highest quality. I often cut costs with generic sugar and baking soda, but when it comes to butter and vanilla, invest/indulge! It makes such a difference! You’ll see the leavening start to activate right away! The batter is really thick and almost airy. I love it! Please, please, please, do not overfill your papers. This cupcake recipe puffs up in the oven, a lot, and you don’t want mushroom tops. Maybe that’s ok for a muffin, but not a cupcake! No more than half full. I’ve made and remade this recipe, and if you fill 24 cups equally, you should be good. 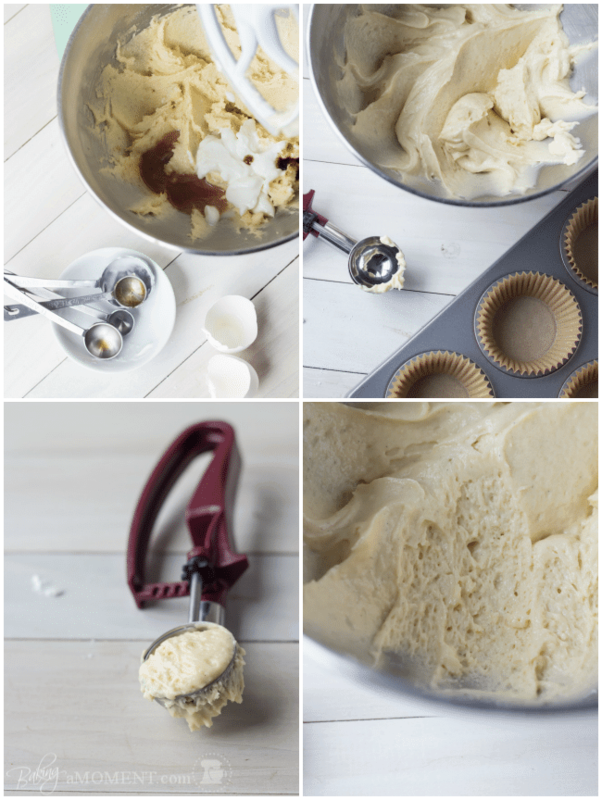 I use this cookie scoop, a little less than 2 scoops per cupcake. So that’s just about 3 tablespoons of batter to a cupcake. Now for a few words about baking. I cannot stress enough that you must check your cupcakes. Set the timer for a minute less that the recipe states (to avoid overbaking). This is across the board, not just with this recipe, but with ALL recipes. Check for doneness by inserting a toothpick or bamboo skewer into the thickest part of your cake. If it comes out clean or with a few moist crumbs, you are good to go. If it’s gooey or there are lots of sticky crumbs clinging to it, add a minute to the timer and then check ’em again. Ovens are tricky. No two are exactly the same. Some run hot, some cold. Some are hot in one area and cold in another. (Try to position the rack in the middle of your oven, so the heat can circulate evenly, all around.) I keep a little oven thermometer in mine so I can be sure it’s calibrated correctly, or if not, I can adjust accordingly. These cupcakes taste wonderful with all sorts of frostings! I personally love them with Chocolate Swiss Meringue Buttercream, but they are also just heavenly with Vanilla Swiss Meringue Buttercream. Or Strawberry Swiss Meringue Buttercream. Can you tell I like Swiss Meringue Buttercream? 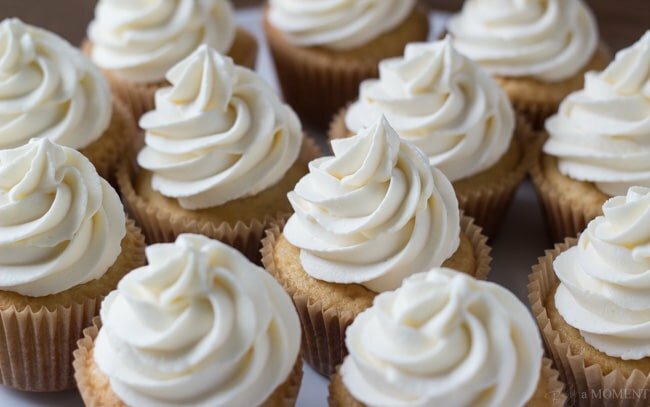 But for today’s post I wanted to keep it on the simpler side, so I’ve used this Whipped Cream Frosting, which contains a little bit of cream cheese to keep it stable. It’s really fluffy and light, and has just a hint of tanginess to it. I should caution you that it will probably never hold stiff peaks in the mixing bowl, but somehow, it miraculously does hold it’s shape (surprisingly well!) when piped. I would make the frosting no more than a few hours before serving, and keep it refrigerated, since it contains dairy. If you want to make these cupcakes ahead, you totally can! Just keep them unfrosted. They’ll keep well in an airtight container, for up to 3 days at room temperature, in the fridge for a week and a half or so, and for months in the freezer! I also find that they seem to get more moist the day after they’re baked. Don’t know what that’s all about, but it works for me! Hopefully I didn’t leave anything out, but if you have a question I didn’t answer, please feel free to leave me a comment below. I hope you enjoy this recipe, and have lots of success with it! There’s just nothing like a homemade cupcake, from scratch, especially if it’s this easy to make! 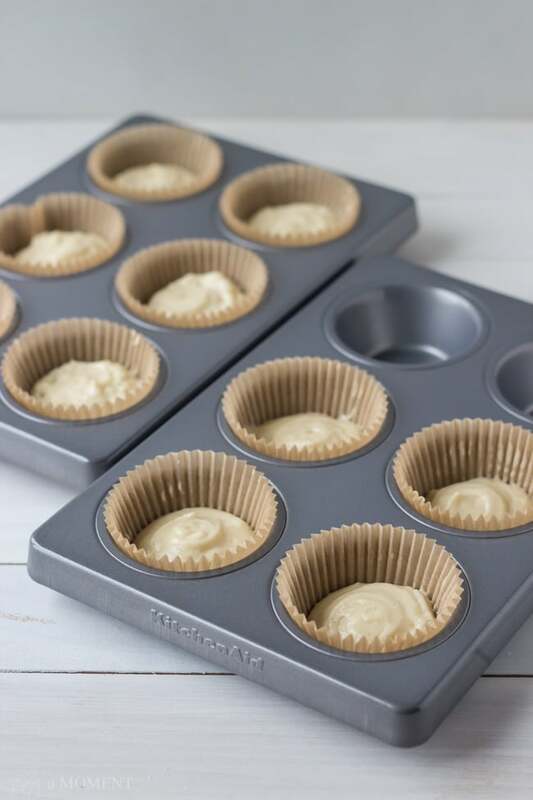 Preheat the oven to 350 degrees and line a cupcake pan with papers. Add the butter, mixing on medium-low speed until the mixture resembles damp sand (about a minute). Add the eggs, one at a time, scraping the sides and bottom of the bowl to be sure all of the ingredients are fully incorporated. Add the yogurt, milk, vanilla extract, and vanilla bean paste. Stir until fully combined. 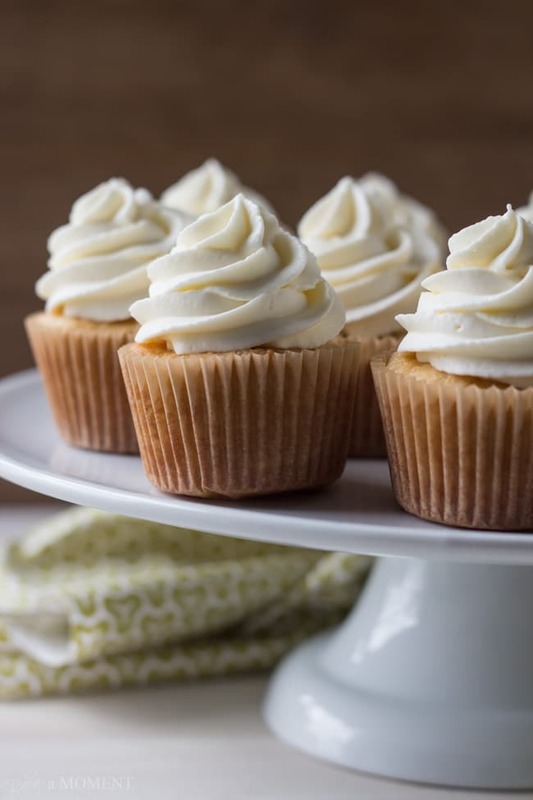 Fill the papers half full and bake for 16 to 20 minutes, or until a toothpick inserted into the center of a cupcake comes out clean or with a few moist crumbs. I have never made cupcakes from scratch before but you’re getting me motivated….. Sometimes, the simpler recipes are just the best ones. Vanilla bean anything is just a party in my mouth. Looks scrumptious. Yay! Thanks so much Sarah and I hope you enjoy them! When I started blogging, I did in-process photos for every post, and then it just got to be too much for me. But there were so many questions on that vanilla cupcake recipe, I just thought a tutorial might be in order. I’m so glad you liked it, thanks so much for all the great feedback. I can always count on you to be so sweet and supportive, and it means the world to me! These are such lovely cupcakes. Perfect indeed! These really do look super simple to make and they look divine! 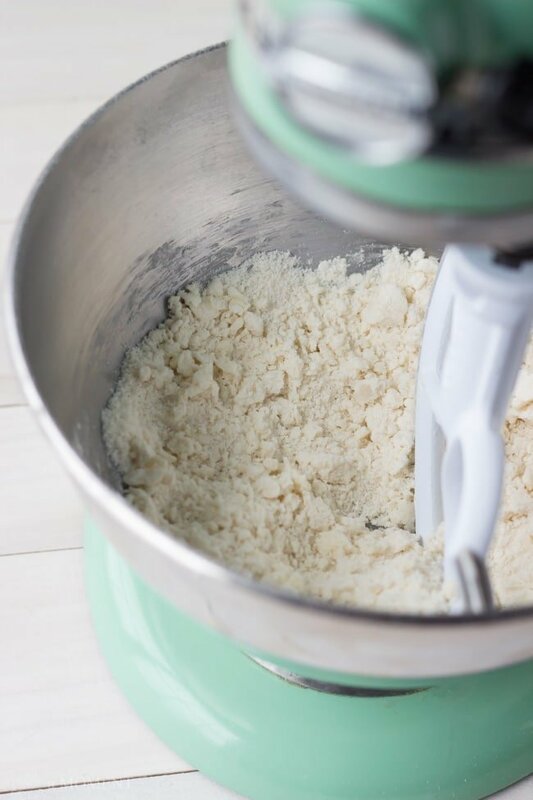 I’ve never used a combination of cake flour and a/p, and that sounds like a really great idea…plus Greek yogurt is always a bonus. 🙂 I love using vanilla bean paste…it’s the best, and I need that paddle attachment with silicone edges. Pinning! Thanks for the pin, Marcie! I put off buying that paddle for years because I thought it was too pricey, but then I lucked out and found it at HomeGoods for like $14. It was worth every penny! Such a timesaver. I’ve found the vanilla bean paste there too. And the combo of flours works really well I think- cake flour for tenderness and ap for structure. I’m so happy you liked the post! Thanks so much for the nice comment and I hope you have a fun weekend! This is exactly how I love cupcakes, same with my younger son, so I will have to give these a try! I really love these cupcakes! Thanks for the recipe and the pictures. Thanks so much for sharing on Pinterest, Sweet Mango! I’m so happy you liked the post, and I hope you enjoy the recipe. Thanks for stopping by and for the sweet comment! Thank you so much Gloria! I knew after my last vanilla cupcake post that in-process photos were in order. There were just so many questions! Sometimes it just pays to take the extra time and do things right 😉 I’m so glad you liked the post, and I hope you enjoy the recipe! Have a great weekend, friend! First of all, thank you! I have been searching for the perfect vanilla cupcake recipe for what seems like eternity. No joke, every time I think I have it right, something goes wrong. Too dry, too dense, too whatever. I’ll have to try these immediately! I’m going to be baking these this weekend. Oh Graham, I sure hope you like them! I’m sure you have very high standards. As do I! I was really happy with the end result here, and especially the LACK of dirty dishes 😉 Ain’t nobody got time for that! Enjoy, and have a great weekend! Allie, I am loving everything about this post! It shows how much love and finesse goes into something so delicious and simple. Most people assume that I am a chocolate girl when it comes to cakes and cupcakes, but vanilla definitely has my heart. Cannot wait to give your recipe a try – it looks absolutely perfect! Now these do really look like perfect vanilla cupcakes! I love that you use vanilla bean paste … that stuff is just so so good! I love playing with different flavors but vanilla is still my very favorite cupcake … with a vanilla frosting to go along with it! Oh I know! I love that paste- so much vanilla flavor, and easier and more economical than whole beans. And that Lagrima extract is seriously the bomb. Thanks so much for the sweet comment, Ashley! Thanks, Dina! My kids sure think so 😉 Have a great weekend, dear! These.look.amazing. Seriously, I have been looking for a vanilla cupcake like this! And I especially love that they don’t have any domey tops! Perfect for frosting! Hi again allie i tried your simply perfect chocolate cupcake it turned out very moist and delicious! But unfortunate im not that very happy with the cocoa powder i used. I guess it all depends on the quality of the ingredients. Next time ill use a better quality of cocoa powder. I just used what locals in our place often use and not the branded ones but overall the results are perfect still! Ill be trying this next as this one got no cocoa powder in it and its simple and the photos of your finished products are making me jealous! By the way i made a butter milk as substitute for the greek yogurt in the chocolate cupcake. Can i use buuter milk as substitute again even when this vanilla cupcake recipe got milk in the list of ingredients? And what do u meepan by 1%? Thanks allie! I think that would probably work well, although I haven’t tested it myself to be absolutely sure. The 1% is just referring to the amount of fat in the milk- whatever you have should work! Hi again Allie! I just made this recipe tonight and i love the overall result! the texture when i had that first bite is just what i wanted but it normal for the flavor of the egg to stand out?or im just sensitive. im definitely doing this recipe again! also, the top of my cupcakes’ color of is a bit off, its rather white and not like the cupcakes on your pictures. probably because i used 1/2 cup buttermilk to substitute 1/4 yogurt and 1/4 milk. Is it possible to add lemon zest or juice to the recipe so i can make it citrus-y? if yes, how many should i put in Allie? Thanks a lot for always replying! Absolutely Nin! It’s great with a little citrus. I would use anywhere from 1/2 to 1 lemon, depending upon your taste. Hope you enjoy! You did it again Allie! Now I have to find an excuse to make these very, very soon. I love that you only need one bowl and love that you made it simpler and more perfect. Love your cupcakes. They fit its name of being perfect indeed! Beautiful. Your step by step photos are incredible! I love all of these photos. And of course, these cupcakes. They really do look perfect! You did a great job incorporating so many different ingredients (yogurt, cake flour, vanilla bean paste) Double thumbs up! Pinning! Thanks so much, Mary Frances! Those are all favorite ingredients of mine and I really think they each add something special. Hope you’re enjoying your weekend, sweetie! These look so beautiful! Goodness, I wish I had one in front of me now. I’m sharing and saving these cupcakes for my next weekend baking adventure. Thank you for doing such a beautiful job with them. I think cake flour makes all the difference. Allie, this recipe is definitely getting pinned, shared, made, etc. etc. It’s obviously thoroughly tried, tested and loved and so I trust it intrinsically! Also, I really love your ‘process’ photos (especially that lovely blue mixer). Maybe you should do that more often! AMAZING!!! I cannot believe you improved upon that already perfect recipe-but you did! Allie, these DO look simple and perfect. Not to mention gorgeous. I’ve never seen a whipped cream cheese frosting that pipes so beautifully. 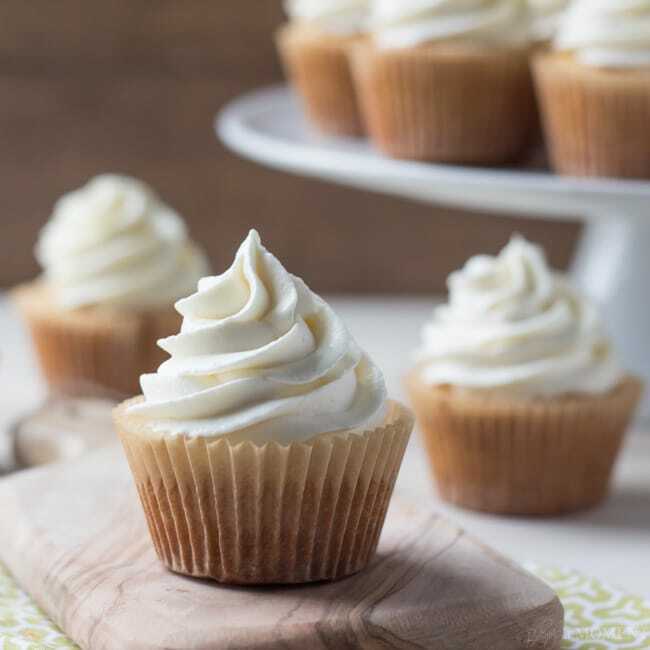 It’s incredible that just two tablespoons of batter creates such a light and airy cupcake! And I love one-bowl cupcake recipes. I will definitely have to try this recipe. BTW, I love all the in-process photos. I am always too scared to bring my camera into my kitchen (aka, disaster zone) for fear of getting flour or sugar on it. But these pictures are super helpful! Thanks so much Jamie! I actually bring my mixer and everything else into another room to take the pics. I have terrible light in my kitchen! So you can see why I grumble about taking in-process photos. It’s a pain but I knew from the last post that there’d be lots of questions if I didn’t do it! I hope you enjoy the recipe, and that whipped cream cheese frosting is really good. It looks super gloopy in the bowl, but somehow it pipes really well! These look amazing Allie! I love the clear, step by step photos! Definitely cannot beat a good vanilla cupcake! What a great post, Allie! Such great tips, and such an amazing looking cupcake! Definitely trying your recipe the next time I make cupcakes! Pinned! I haven’t made cupcakes in AGES! These look so good!! Oh you need to make yourself some cupcakes, girl! It’s been too long 😉 Whip out that mixer! You won’t be sorry, lol. Thanks so much for reading, and for the comment! Your cupcakes look absolutely perfect and so delicious! Beautiful! Hi, can i make one big cake (no layers) out of your vanilla cupcake recipe? I’m sure that would probably work but you would have to adjust the bake time. You’ll know the cake is done when a toothpick inserted in the thickest part of the cake comes out clean. Good luck! These cupcakes really do look absolutely perfect!! Can’t wait to try your recipe, Allie! Thank you so much, Cathy! I’m just loving this recipe, and how easy it is to throw together. Thanks for the sweet comment and I hope you enjoy! hi allie how do you think should i do it? since i dont have any yogurt..im thinking of substituting it with buttermilk. but is it okay to add milk again since the recipe calls for it? Hey Nin! You can replace the milk with buttermilk or replace both the milk and yogurt with buttermilk. As long as you have 1/2 cup of liquid and there’s a little acid in there to activate the baking powder, you should be good to go. Good luck! Looks amazingly perfect! Thanks for linking up with What’s Cookin’ Wednesday! I’m so eager to try this recipe but Greek yogurt is very expensive here in Malaysia. Can i use buttermilk as a substitute for the yogurt and milk? What will the measurement be if i were to use buttermilk? Thanks! But if I were to use buttermilk which is already very liduidy, do I omit the milk altogether? So, is that substitution measurement for buttermilk still 1/4 cup as per the Greek yogurt or 1/2 cup to replace the milk as well (1/4 greek yogurt +1/4 milk)? Hope you understand my question..lol! I do, and I’m sorry I didn’t address it properly the first time! I would probably use all buttermilk, just to keep it simpler, so therefore, 1/2 cup to replace both. Hope that helps! ah so heres the answer i was looking for. so i omit the milk and replace it with 1/2 cup buttermilk for both the greek yogurt substitute and the milk. did i got that right? thanks allie! That’ll work! Good luck and enjoy, Nin! These cupcakes definitely look amazing n tempting. I’m planning to make them soon however I dont have vanilla bean paste is it ok if I skip that ingredient n use more of vanilla extract or what do u suggest? Hey, thanks Saleha! You can absolutely leave out the vanilla bean paste, and up the extract. Or not! Either way they will come out just fine. I just like the paste for a flavor boost. So happy you like my chocolate cupcake recipe too! That is one of my absolute favorite things on this blog. Thanks for the great comment! Hope you enjoy! Awesome! I’m so glad to hear it! And it’s my pleasure 😉 Thanks for reading and for the great feedback, Jessica! Thanks for the updated recipe, I shall try it next weekend!! Good luck~ I hope you enjoy, Danielle! would it be okay to add 1/4 cup oil and 1/4 cup butter instead of the whole 1/2 cup butter? I was reading a post about oil+butter base cakes taste better with better texture. whats your opinion on this? Hi Shannice! I’ve never tried it myself but it sounds like a pretty good idea. Oil does make for a really moist cupcake and light too. I’m anxious to hear how it works out for you! Will you stop back and let me know? Good luck! Hi Madhu! Thanks so much for reading my blog and trying one of my recipes! I’m so glad you were happy with it. I have baked it into a cake and it’s worked really well. You could do it at the same temperature and have a really nice result, but when I bake layer cakes I typically like to lower the oven temp by about 25 degrees F and increase the bake time as required. I find that the cake bakes more evenly that way and there’s usually less of a hump in the middle. I don’t mind a hump on a cupcake but I hate it on a layer cake because so much is wasted in levelling it off. Good luck and I hope you enjoy! Thank you very much! I will definitely be giving it a go! Oh and one more thing, will this quantity be enough for a single layer 8 inch round cake? Sorry for the trouble! No trouble at all- I think you should definitely have enough batter for an 8-inch round. Maybe even enough for two layers. Good luck! Just wondering if i can use wholewheat flour for this recipe? Hi Sabrina! I’ve never tried it with whole wheat flour- I’d be curious how it’d work…? I’d probably recommend using whole wheat pastry flour rather than regular whole wheat flour, just because I’d imagine regular whole wheat flour may be a bit heavy. Let me know if you try it/have success, ok? And thanks so much for reading! 1) I love how amazingly moist and fluffy it is – have searched around for the perfect basic butter cake recipe, and this is IT. 5) I love how this for teaching me the reverse creaming method – how have I not heard about it before after being a home baker for more than 4 years?? 6) I love how versatile it is – lemon cupcakes? just rub in some lemon zest! chocolate chips? fold them in! I could go on, but 7 is the number of perfection, and perfect this most certainly is. I am planning on making a ton of cupcakes for a kids birthday party and don’t really feel like splurging on pastry flour (5 yo don’t care that much 🙂 ). The corn starch can says I can mix the corn starch and ap flour and get the same results as cake flour, do you know if that’s really true? 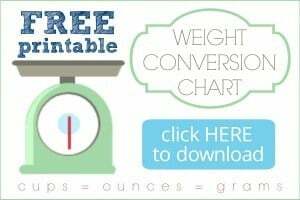 I haven’t actually tried it myself but I have seen that formula floating around the web quite a bit- so I think it should work! Good luck and let me know, k? Thanks Yulia! Hello Allie! I have tried this recipe and I just want to thank you for sharing this gem! Bakes up beautifully fluffy! Do you think substituting the Greek yoghurt with plain, natural yoghurt will affect the texture? I love Greek yoghurt but it is a tad costly in my part of the world. I am planning to bake a lot of these cupcakes. Thanks! Hi Twisted Sunshine! Sorry for the late reply… I have never tried it with canola oil, so I’m not really sure. As for the milk substitution, I don’t think I would because it won’t give you the acidity you need to activate the baking soda. Maybe try sour cream instead, if you aren’t a fan of Greek Yogurt? Or buttermilk? I hope that helps! Good luck and thank you so much for reading! These cupcakes look beautiful and I must try them! Never made them with yogurt and I’m curious how they are bona turn! Pinning! Thanks for pinning, Mira! I think you will really like these, they are a family favorite around here! At first when I took them out of the oven they looked great, but then by the time I served them, 5 hours later they had sort of shrunk and condensed (although they still tasted pretty great and everyone loved them!). Do you have any advice on why this happens and how to avoid it? Hey Juliane! Thanks so much for reading my blog and trying one of my recipes! I’m so glad you liked the taste but sorry about the shrinking. In my experience that has happened when either a) they are a little bit underbaked, or b) I wrap them up or cover them before they are 100% cool. Sometimes the oven temperature has something to do with it. I would try baking them at a little higher temperature next time, and see if that helps. I’m so glad you liked the buttercream too, isn’t it just so dreamy??? 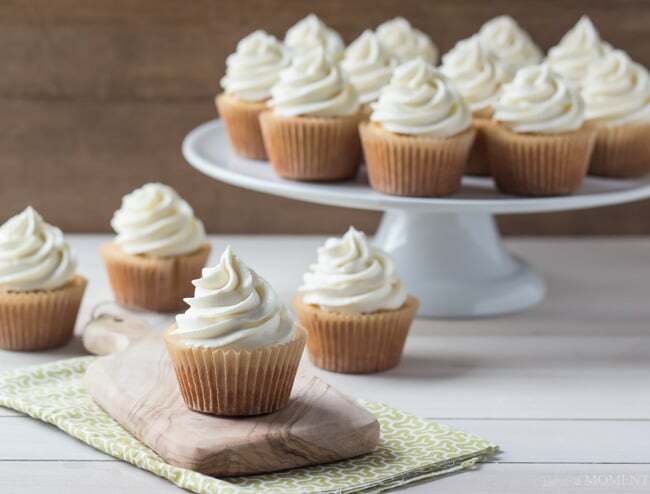 Do you know why sometimes cupcake bake so that instead of being flat on top, they don’t reach all the way up to the top of the cupcake paper on the sides but they are domed in the middle? Great! I’m so glad it’s working for you now. The dome can be caused by too much leavening in the recipe and/or too high of an oven temperature. Also it sounds like maybe you could fill your papers a little more. I personally prefer a little bit of a dome on my cupcakes but if you like them flat then maybe try baking at a lower temperature. Good luck and thanks again for reading! No problem, Juliane! It’s an open star tip. I believe it’s 1M. Good luck and have fun! My pleasure, Melanie! I’m so happy you enjoyed them; thank you so much for letting me know! 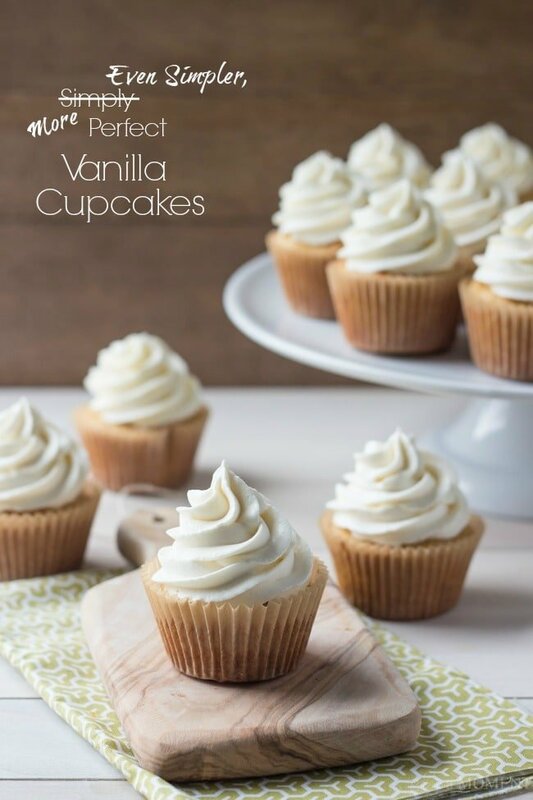 Hi Allie, we really swear by this recipe, it is the only vanilla cupcake recipe that I use. However, one of the kids at my daughter’s new school has an egg allergy and I am planning to bring cupcakes for her coming birthday. Would you know of a substitute for eggs in this recipe? You can substitute eggs with chai seeds. You soak chai seeds in warm water and add into the batter- the mixture is very gelatine like. I’ve used in all of my baking and it works! The proportion can be looked up in Google. I hope this tip helps! Thanks so much for the great tip Tanya! I’ve never used chia seeds but I know that flax seeds work in the same way. Very useful info! Thanks for this wonderful recipe. I made a batch of the vanilla and a batch of the simple chocolate cupcakes from this site for my 3 yr olds birthday party. They are great because they are quick to whip up, make very little mess (only 1 bowl, 1 half cup measure, 1 spatula, and 1 teaspoon dirty! ), taste great and freeze well. Great for a busy parent! I made them 2 weeks before the event and froze them and they defrosted beautifully on the day. By the way, when substituting ground flax seed for eggs in party cupcakes, I always prefer to use Melrose brand ground yellow flax as it is ground very fine and you can’t see it in the batter. When making muffins, or more hearty baked goods I use Bob’s Red Mill ground brown flax which is a coarser grind and results in a ‘healthier’ look and feel. Different brands produce different binding properties so it pays to experiment. Hello. I just wanted say this recipe is “holy grail”!! I have always been weary making cupcakes for fear of being dense and tasteless, but I tried your recipe and they turned out amazing! I knew they were going to be amazing when I saw the batter. I really do like the reverse creaming method, as I had the most silkiest, aerated batter! I took your advice you gave to another commenter and used 1/2cup buttermilk to replace the milk/yogurt, and they came out perfect (coming from a first time cupcake baker)! I think it also helps to use a timer to prevent over mixing. Thank you for sharing your recipes and I’m gonna try to make this buttercream! Looks so yummy! Can i make a 9×13 sheet cake with this recipe? The cupcakes shunk up when they cooled. Have you had that happen ever? It is the strangest thing. The tops are all puckered and have “fallen” now that they are cooled. Hi Lisa! It used to happen to me from time to time too. Then I found this article: http://www.itsyummi.com/why-cake-sank-in-the-middle/. There are some really great tips there. I learned a lot and it’s really helped me to get better results with cakes. I hope you find it useful too! Hey Allie! I love these cupcakes but I need to make a regular cake for an event. Do you know if this recipe will work for a standard 13 x 9? Thanks! Hey April! I haven’t tried it myself but I can’t imagine why it wouldn’t work. I’m thinking you’ll probably want to double the recipe though- and for cakes I always like to reduce the oven temp to 325. It helps them to not have a big hump in the middle. Obviously keep an eye on it and test for doneness. It will require a longer bake-time. Good luck and enjoy! Wonderful! I’m so glad you were happy with it and thanks for sharing your experience! Can i use all cake flour instead of cake and all purpose? What will the difference be? Hey Carrie! I’d recommend making the recipe as written. Each kind of flour brings a certain level of tenderness/strength to the final result. You can read more about cake flour vs. all-purpose flour here: http://www.wilton.com/forums/messageview.cfm?catid=7&threadid=168315. Hope that helps! What could the reason be? Do I need to lower the oven temp even more? I wouldn’t change a thing, Carrie! If they turned out well for you the first time, chances are something was different the second time around. I just re-tested the recipe last week and the results were consistent. Good luck and thanks for reading! I tried this today. The cupcakes were soft and fluffy. However there were several big holes in them and weren’t high as yours.. like an inch high only when I made 18 cupcakes. Did I do anything wrong? It sounds like maybe the batter was overworked? Either that or maybe there was an issue with oven temp or leavening. I like to use an oven thermometer just so I can see that my oven is working right. You can buy it at the supermarket for less than $15. And you want to make sure that your baking powder is fresh- there should be an expiration date on the bottom of the canister. The only other thing I can think of is just to make sure they go into the oven right away because that leavening will poop out if the batter sits too long. I hope that helps! I just made the. Made some mini and some regular size. So easy!! What would make them have little tunnels in them? Hi Joyce! Table salt and kosher salt are not interchangeable in equal measure. You can read more about it here: https://www.google.com/webhp?sourceid=chrome-instant&ion=1&espv=2&ie=UTF-8#q=substituting%20table%20salt%20for%20kosher%20salt. Hope that helps! Thanks so much and have a great week! The cake tasted just so wonderful. Its very simple to make it but taste not simple at all! Thank you so much for the awesome feedback! I tend to prefer desserts that aren’t overly sweet, I think it allows the other flavors to really shine through. I’m so glad you agree! Can I use oil to replace eggs? My son loves vanilla but is allergic to eggs 🙁 Do I need to change anything in the recipe, like the leavening agents, to get the same results if I use oil? Hello there 🙂 There’s a very mouth watering cupcake recipe there but I wanted to ask what can I add in place of vanilla beans paste? Because that product is very difficult to get from my country 🙁 Will vanilla essence work here? I’m not familiar with vanilla essence Farwah, but if that’s the same as vanilla extract then it should work just fine! Good luck! Love your recipe, Allie! I was wondering if I substitute sour cream for greek yogurt, less butter would be required to achieve the same results? Thanks! Hey Kewpie! That’s a great question- the answer is no, not at all. You can substitute sour cream or buttermilk for Greek yogurt, in equal measure. Hope that helps! Hi! I noticed that in the chocolate version you can sub buttermilk for the Greek yogurt. Can you make that swap in the vanilla as well? Hey Teresah! Yes, you absolutely can. Thanks for the great question! These cupcakes were amazing! Truly, they were simply perfect. I followed the recipe exactly and they turned out absolutely fabulous!! So amazing, thank you for sharing! I was skeptical about how little batter I was putting into the liners but they turned out just fine. I messed up the frosting (didn’t quite follow the directions… had lots of things going on) but I will try again and I’m sure it’ll turn out well too! I’ve tried quite a few recipes on your website and every one of them (except for the vanilla swiss meringue buttercream, which was my fault) turned out amazing! Thank you for sharing your talent and passion with the world, you are now my go-to Food blog! Keep up the great work! You’re awesome! Wow Daphne! That is so amazing to hear and I really appreciate the great feedback and encouraging words! Thank you so much for making my day. And I’m so happy you liked the cupcakes! Is this the updated recipe you spoke about Live today? Yes! You found it Sharon! Thanks so much for watching! I love these! Simple recipes are the best! These are so light, fluffy and perfect! I’m not sure what I’m doing wrong but I just can’t seem to get these to not shrink after baking. When baking at the temperature specified after 16 mins they were quite dark and sunk, so I lowered the temperature and baked for longer, paler but still sunk. My tooth picks are coming out clean, can they still be underbaked? Also do you do 350f in a fanforced oven? Sorry for all the questions, any advice is greatly appreciated! Hey Jasmine- so sorry you’re having trouble. It does sound like they could really use another minute or two in the oven. No fan necessary. Hope this is somewhat helpful! So light fluffy and perfect!